Stamping and Cardmaking with a little side of Scrapbooking.....Bon Appetit !! Time for another quick card. 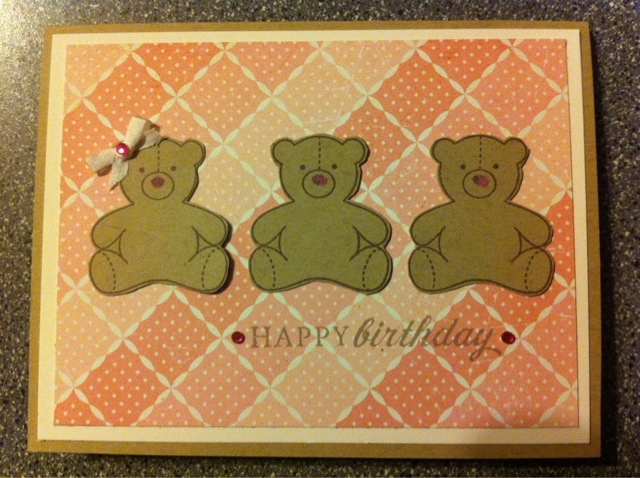 We have a teddy bear picnic birthday party this weekend - how nice to have a stamp for every occasion ! Some crate pattern paper, rhinestones, a little bow ( lets not discuss how long it took me to tie! ) and some flocked noses. Cute interpretation of the sketch! Those bears are just too cute! Such a sweet card Rose! Love the bow on top of one of the bears! Thanks so much for the love you left on my blog - really made me smile! I am a mom of three who LOVES cardmaking, scrapbooking and all things paper. Only Love Is Real! Papercrafts.